Raina Kabaivanska (Bulgarian: Райна Кабаиванска; née Yakimova (Bulgarian: Якимова); born 15 December 1934) is a Bulgarian opera singer, one of the leading lirico-spinto sopranos of her generation, particularly associated with Verdi and Puccini, although she sang a wide range of roles. Born in Burgas, Bulgaria, she studied in Sofia with Prokopova and Yosifov, and made her debut at the Bulgarian National Opera in Sofia as Tatjana in Tchaikovsky's Eugene Onegin in 1957. The following year, she left for Italy for further studies with Zina Fumagalli-Riva in Milan and with Giulia Tess in Vercelli. Two years later she made a breakthrough in Fano, Italy, as Nedda in Leoncavallo's Pagliacci. In 1961, she gave her first performance at La Scala in Milan, as Agnese in Bellini's Beatrice di Tenda, opposite Dame Joan Sutherland. She sang widely in Italy, Genoa, Venice, Parma and notably in Turin in 1973, as Elena in I vespri siciliani, in the only production ever directed by Maria Callas. In 1962, she made her debuts at both the Royal Opera House in London, as Desdemona in Verdi's Otello, and the Metropolitan Opera in New York, as Nedda. She went on performing at the Bolshoi Theatre in Moscow, the Teatro Colón in Buenos Aires, the Paris Opéra, the Vienna State Opera, the Budapest Opera, the Lyric Opera of Chicago, the San Francisco Opera, the Dallas Opera, the Teatro dell'Opera di Roma, etc. She also appeared in a few opera films, notably Pagliacci, opposite Jon Vickers in 1968, Il trovatore, opposite Franco Bonisolli, in 1975, and Tosca, opposite Plácido Domingo, in 1976. A versatile singer with a beautiful voice and fine musicianship, she is also a singing-actress of considerable ability. Kabaivanska has received the following international opera awards: Bellini (1965), Viotti d'Oro (1970), Puccini (1978), Illica (1979), Monteverdi (1980), the Award of Accademia 'Medici' - Lorenzo il Magnifico, Florence (1990), the Grand Prix 'A Life, Dedicated to the Music', Venice (2000). At present, Kabaivanska is a professor at the Accademia Musicale Chigiana, in Siena, Italy. She has a Master Class for performers of Puccini's works, as well as master classes in Spain, Italy and France. She is also a jury member for many prestigious competitions all over the world. Kabaivanska delivered an emotional performance of the "Ave Maria" from the opera Otello by Giuseppe Verdi to open the funeral mass for Luciano Pavarotti in Modena, Italy on 8 September 2007. 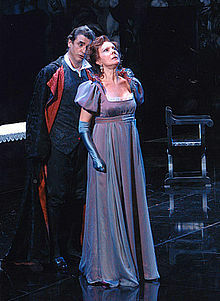 Kabaivanska has recently added another role to her considerable repertoire: the Comtesse in Tchaikowsky's Queen of Spades, in a series of five performances (31 January - 19 February 2008) at the Capitole de Toulouse. ^ Premio "Una vita nella musica", given by Associazione "Omaggio a Venezia" and "Gran Teatro La Fenice"
This page was last edited on 23 February 2019, at 18:53 (UTC).